Though pistols aren't primary arms, they certainly have a role in modern warfare: often a pistol is the only weapon an officer carries. 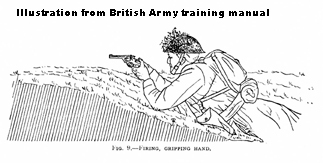 In the aftermath of the First World War the British Army was re-thinking its tactical doctrines in light of lessons learned, and the needs of training a small Regular force intended to be supplemented by Territorial reserves. The Army had lost most of its long-service members in the wholesale slaughter of 1914-1918: few company- or field-grade officers had been in service more than a few years. Among the concerns the Brass Hats had was the fact that very few soldiers in the peacetime Army had served and trained long enough to shoot the big .455 caliber Mark VI Webley revolver accurately. Something less bulky and cumbersome, with lower recoil, seemed to be desirable. The eventual replacement for the Webley was the Enfield-made "Pistol, Revolver, No. 2, Mark I" in the much less powerful .380-200 caliber. A .38 wasn't an ideal choice, as the US Army had learned (the hard way) during the Philippine Insurrection, where light, medium-caliber revolver bullets were shown to be poor man-stoppers; the .38 Long Colt had been such a flop in combat that they'd called many M1873 .45's back into service. The 1907 Thompson-Lagarde tests had reached the conclusion that no caliber smaller than .45 was suitable for US Army service. Now, the leadership of the inter-war British Army was well aware of this, of course; even they knew that no .38 caliber cartridge could match the stopping power of the .455 whose 265-grain bullet, even at its moderate velocity, had proven itself in combat against African tribesmen, the fanatical hordes of the Mahdi's followers, and Feldgrau-clad German infantry in the trenches of France. But they reasoned that since revolvers were not primary weapons of combat, and since their use would be at close ranges, accurate shooting could make up for deficiencies of power. The ".380 Revolver" round had been developed in the middle 19th Century for use in small concealable revolvers. It's a pretty anemic round (a 124 grain bullet at 625 fps, for a whopping muzzle energy of 110 foot-pounds) similar to the .38 Short Colt. In 1887 Smith & Wesson had developed the .38 S&W round for its line of top-break revolvers. Boasting a heavier bullet (160 grains) and more energy (250 f-p at the muzzle), it was better but still no world-shaker. Starting from these two datum points, the Webley firm, with an eye on the new requirements, developed a new round in the early 1920's for British Army trials. It fired a 200-grain lead bullet propelled by "Neonite" powder at a muzzle velocity sufficient to give it reasonable power. At 50 yards the bullet was moving at 570 fps, with almost 150 f-p of energy. Subsequent developments led to the approval of this round as the ".380-200" in 1922, and it became the official caliber of the Army with the final development of the "Pistol, Revolver, No. 2 Mark I" in 1932, and its general issue to troops. It proved to be an accurate and durable weapon, much easier to shoot than the .455. The British went to war in 1939 with this as their primary sidearm. During World War Two the No. 2 Mark I underwent a few minor design changes, partly to speed up production and partly make it more suitable for special troops. Most notably, these included modification of the hammer to eliminate the cocking spur, and a change in the lockwork to make the revolver double-action only. 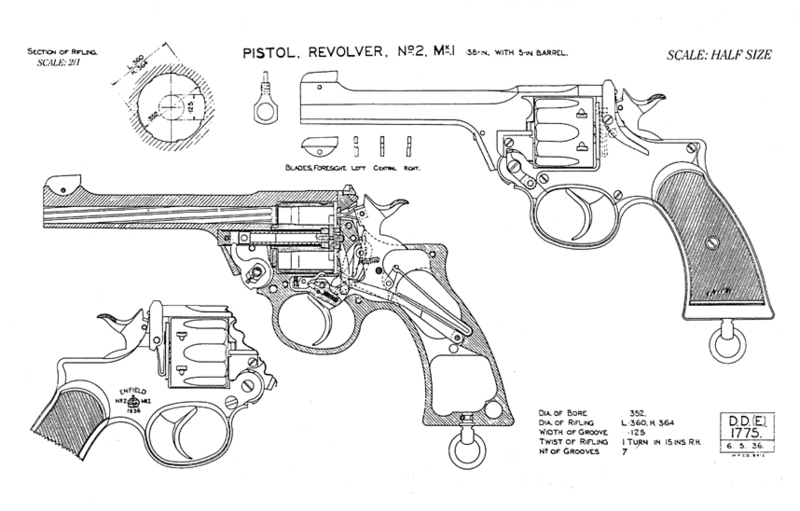 Other than the lockwork modifications, the gun remained the same, and was designated as the "Revolver No. 2 Mark I*" in the official lists of equipment. Briefly a "No. 2 Mark I* *" was manufactured, which lacked the hammer rebound, but these were found to be unsafe in service (they would fire if dropped on the hammer) and were soon withdrawn. The I* * guns were re-converted to the I* configuration with rebound feature. Sometimes these DAO guns will be referred to as "Commando" models. The story is that they were designed for use by British special forces; but in fact the changes came about at the request of tank crewmen, who found that the hammer spur caught in their clothing and on projections inside their very cramped tank interiors. The No. 2 Mark I* was made in large numbers, and used by almost all the Commonwealth nations. Many were adopted for police use after the war, and this gave rise to another story about them of dubious authenticity, but often repeated. More on this below. In the mid-1950's the reliable No. 2 revolvers were replaced in British service by the Browning High-Power (though No. 2's soldiered on for many years: Skennerton's book records them as having been issued as late as 1970 in some places). Despite its fairly long service life, the No. 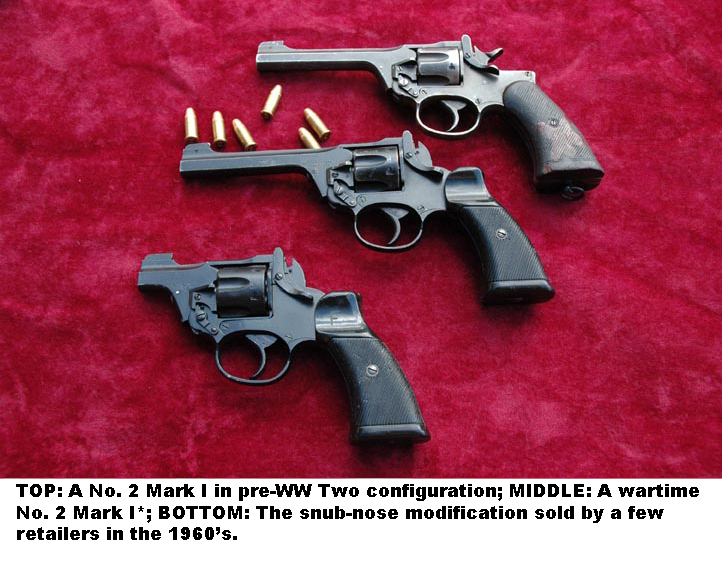 2 series went through only a few changes, and collectors recognize relatively few variants compared to the bewildering variety of Marks and modifications in the Webley series of top-break military revolvers. An oddball variant of the No. 2 that's occasionally encountered is a short-barreled variety, one of which is shown here. This little plug-ugly was recently advertised on the GunAuction.com site as a "Police Constable's" revolver, which it most certainly isn't. It's a garden-variety No. 2 I* revolver with a nose job. These guns come up for auction now and then, and I'd been looking for one for quite a while, so I bought it, for only 17 times its 1960 price! Over the years I've sometimes seen such guns advertised, but they can't be numerous. I've known of their existence for decades, and have seen three or four advertised on Internet auction sites, but had never actually seen one "in the flesh" until I bought this one. This short-barreled variant is in fact a purely commercial one, a modification of existing No. 2's for the US market. I have concluded that a now-defunct importing firm did this conversion as a way to increase their sales. The guns are merely British Army surplus with the barrels cut off and the front sight re-positioned. But the conversion from a 5" to a 2" barrel is so well done that someone who comes across these rather scarce No. 2's assumes it was originally made that way. To the best of my knowledge the conversion was done only to a small batch of the DAO guns: I've never encountered nor have I ever seen advertised a similarly-modified No. 2 with a hammer spur. An ad from the September 1960 American Rifleman is shown here: the importer in this case was Seaport Traders, a firm in California operating in those days. Another firm that sold the snub-nosed No. 2's was Pacific Arms (or perhaps Pacific State Arms) of Stockton, CA. Both have long since closed their doors and if any of their records exist so far I've been unable to locate them. In researching these weapons I came across some documents in, of all things, the Warren Commission Report, that sheds light on their origin and who did the work. Seaport Traders was the firm that sold the S&W revolver that Lee Harvey Oswald used to kill Dallas policeman J.D. Tippitt. It was sent to him under the name "A. Hidell" in 1962. In their hearings the Warren Commission subpoenaed Mr Heinz Michaelis and Mr George Rose, and took their testimony in the matter. Seaport Traders was a mail-order subsidiary of the George Rose Company, a small importing firm. Mr. Ball. Now, what business is George Rose & Co. engaged in? Mr. Michaelis. George Rose & Co. are wholesalers and sell to retail stores. Mr. Ball. What do they sell? Mr. Michaelis. Musical instruments, cutlery, firearms, watches, clocks, and various others. Mr. Ball. Does George Rose & Co. engage in any mail-order business? Mr. Michaelis. Yeah; we get mail orders, too. Mr. Ball. Now, there is also a company called Seaport Traders, isn't there? Mr. Michaelis. Seaport Traders is another mail-order business. Mr. Ball. Now, last fall did the Federal Bureau of Investigation visit your place of business and inquire as to the sale of a certain Smith & Wesson revolver? Mr. Ball. Now, from that looseleaf notebook were you able to determine from what source you bought the gun? Mr. Ball. Can you tell me now where you bought the gun and when? Mr. Michaelis. We bought it from Empire Wholesale Sporting Goods, Ltd., 360 Craig Street West, Montreal 1, Quebec...It went---it was on 10/19/62, in St. Albans, Vt., and from then on it was directed to our place of business, which was at that time 1225 South Grand Avenue. However, the merchandise in question did not arrive before January 3, 1963. Mr. Ball. 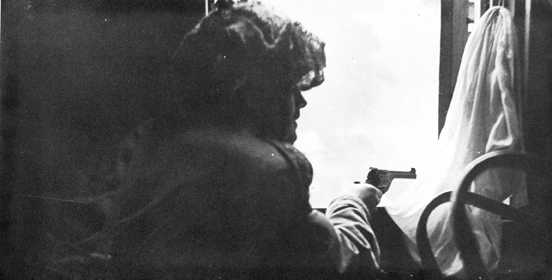 Now, when this gun was first received, what was the length of its barrel? Mr. Michaelis. Five inches....It was changed. Mr. Michaelis. To a 2 1/4-inch barrel. Mr. Ball. How did you happen to do that? Mr. Michaelis. Well, we gave the guns out to Mr. L. M. Johnson [at 13440 Burbank Boulevard, Van Nuys, Calif] and instructed him to make up the guns as far as barrel lengths are concerned to our specifications. Mr. Ball. Why did you shorten them from 5 to 2 1/4 inches? Explain to me for the record. Mr. Michaelis. Because we have quite frequently have calls for the Smith & Wesson revolvers with shorter barrels such as 2 1/4 inch or 4 inch. Mr. Ball. Did you shorten all of the consignment that you received? Mr. Ball. Now, this shows the words A. J. Hidell, P.O. Box 2915, Dallas, Tex. This appears on this invoice A-5371, does it not? Mr. Ball. It is described as an S. & W. .38 special, 2-inch Commando. What is the meaning of that? Mr. Michaelis. Two inch is the barrel length. Commando is a description which we more or less gave because we have another 2-inch gun at a higher price and, in order that the order filler is able to identify between the two types, we have this type described as Commando. Mr. Ball. About how many guns of this type do you sell and ship out of here in a year? Mr. Michaelis. Seaport Traders, I would say that--this is a rough guess....This particular type, that Seaport Traders might have sold maybe 120 in a year; 120, 150 in a year. Mr. Michaelis. I am talking about particularly mail-order business from Seaport Traders. The full-page ad above is from the American Rifleman of July 1960. It shows the shortened S&W Victory models...and unmodifed No. 2 revolvers (which gun is referred to as the "Commando" Enfield). 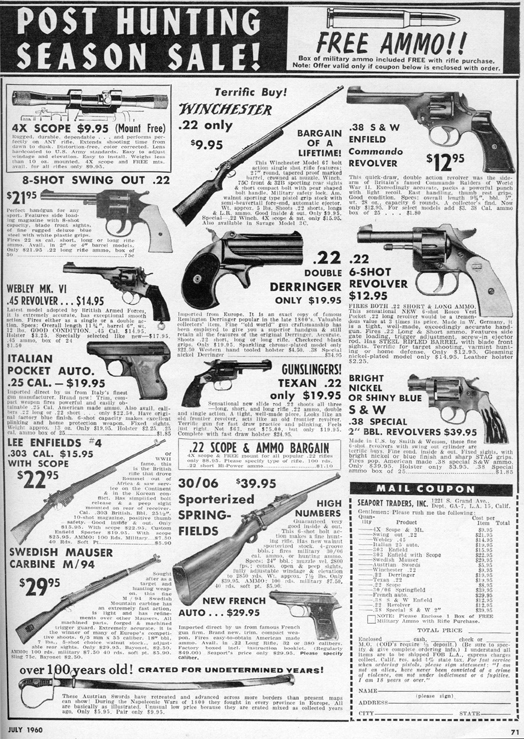 Another ad, showing the shortened #2 Enfield guns from the same firm, appeared in the September 1960 issue, shown here at right. 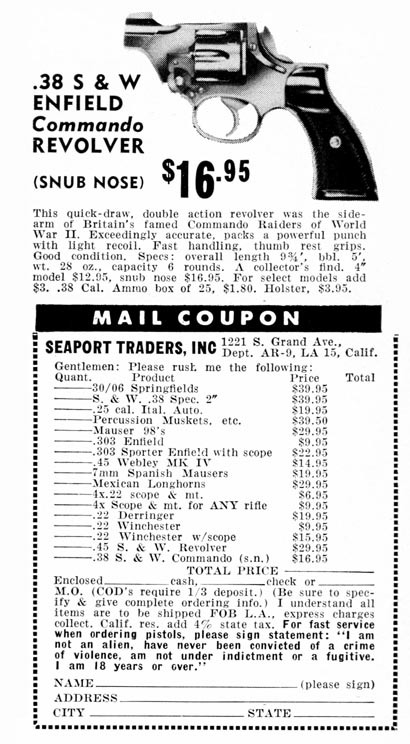 So far as I can tell, Seaport Traders advertised the snub Enfields only in September, while the S&W's were advertised several times in 1960 and into 1962-63. My hypothesis is that the long-barreled #2 's didn't sell well and the shortening between July and September 1960 was an attempt to make them more suited to the American market. I believe the Enfields also came from Empire Wholesalers: a Canadian firm would have had access to large stocks of these surplus revolvers. It seems likely that once the decision was made to shorten them, Seaport Traders sent them off to M.L. Johnson, their contractor gunsmith, added $4 to the price to cover the conversion costs, and hoped the snubbies would sell better than the 5" guns. The shortened Enfield listed for half the price of the S&W gun: it would likely have appealed to people who couldn't afford the more expensive S&W. If only "a small number" of S&W's was converted, surely even fewer of the Enfields would have been, since they apparently were not a hot-selling item. They were advertised only once by Seaport Traders. If this scenario is correct, there are very few of these sawed-off No. 2's floating around. If they were selling 120 to 150 S&W's a year—Michaelis's estimate—then they can't have sold more than half that many No. 2's, if that. Probably fewer than 500 such guns exist. Mr M.L. 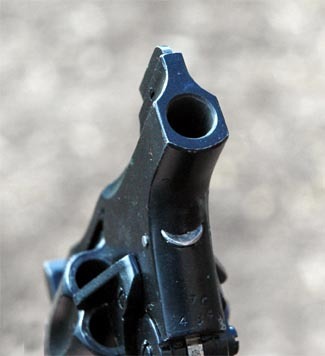 Johnson really knew his stuff: if you know where to look, you can find the seam where the sight was milled off the end of the barrel and silver-soldered or brazed onto the stump, but it's damned near invisible. Furthermore, the muzzle is properly recess-crowned, not just cut off flat. My gun is as tight as if it were new, by far the tightest No. 2 I've ever encountered; and the finish (the standard black baked-on paint job) is pretty much perfect. Since shortening the barrel and relocating the sight would have damaged the original finish, obviously it's been re-finished, but the job is first-class work. Maybe it was one of the "special selection" $3-extra guns if Seaport Traders was the vendor. The workmanship is so good that it's easy to see why people think it must have been some sort of official Enfield product. Whenever I see such a gun for sale I contact the owner and ask them to look for the "seam" under the front sight, and invariably they reply that it's there but hard to make out. This convinces me that no original 2" barreled No. 2's exist, that all of them are conversions. The original front sight base was part of the barrel forging. Nor does Skennerton's book on these guns mention the short barrels at all. All the individuals mentioned here are dead: one of the real frustrations of the gun collector is that the people who can answer such questions tend not to be around any more. I mentioned that probably another retail outlet sold these snubbies. "Pacific Arms" may have been yet another subsidiary of the George Rose Company, but I have yet to locate any hard information on this firm. 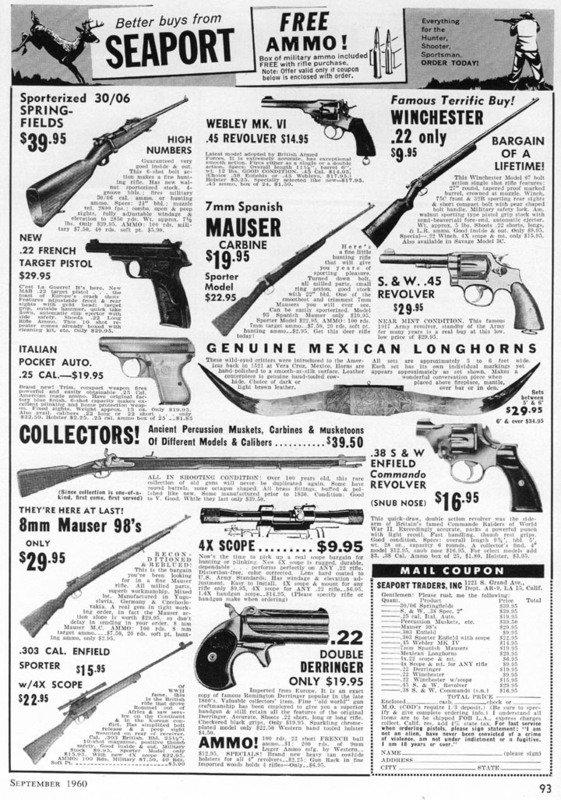 However, in the early 1960's gun magazines weren't the only places guns were offered for mail-order sale. I well remember seeing these No. 2 revolvers advertised in the New York Enquirer (since 1957, called the "National" Enquirer). This fits very well with the idea of marketing to people who found the $39.95 price of a S&W out of reach. The Enquirer of that time was heavily into violence and blood, much more so than now. It appealed to people with prurient interests, to be sure, but mostly to readers who wanted to see pictures of mangled bodies in train wrecks and after shoot-outs. Preferably naked female bodies, but they'd take what they could get, as long as it was dead and mutilated. Full-page photos of people decapitated by subway trains and headlines such as "I CUT OUT HER HEART AND ATE IT!" were standard fare. The advertisements for the No. 2 snubbies in the Enquirer showed a picture of the gun—exactly like the gun in the Seaport Traders ad of 1960—along with an illustration of a guy in a trench coat and fedora hat (just like the detective in the vintage picture at right). He was using his trusty No. 2 to whack some Bad Guys. The ad copy made it quite clear that if you wanted to be a real detective, you HAD to have one to be taken seriously. In those days you could buy such things through the mail, with no papers and no questions, and I remember wondering whether they would send one to a 13-year-old who lived in New York City. I know now they would have (else why advertise in the New York Enquirer?) but I lacked both the courage and the $16.95 to try it at that age. My father has the same first name I do: what little mail I received, he always opened, thinking it was for him. I wasn't worried about the police, I was worried about how I'd explain the arrival of a box containing a .38 to my parents, since they always got to the mail first. The "real" No. 2's did, in fact, serve well in combat despite the underpowered round they fired. The picture at left shows a British soldier using one in battle in 1944. This is the No. 2 Mark I* without the hammer spur. Though it's not an "issue" No. 2, the snubbie is the kind of goofy variant that collectors find interesting. I'm especially interested in finding copies of ads from non-gun magazines. There are very few archival collections of tabloid newspapers, not even the Enquirer, and to date I've been unable to find one of the ads I remember to verify the details. If any of my readers should come across one, any ads for these guns, or any information on either of the two importation firms mentioned above, I would appreciate knowing about it. Much of the information in this piece came from .380 Enfield No. 2 Revolver a fine work by Mark Stamps & Ian Skennerton, published in 1993 by Greenhill Books in London (ISBN 1 85367 139 8). The photo at left is from the Imperial War Museum Collection.